Hello and Happy Tuesday, sweet friends! It’s a new week and I do hope this new week finds you well and delightfully refreshed after the weekend. If you follow me on Instagram it will not surprise you to hear me say that I love Sundays. Sundays have become the sweetest and most restful days for us over the past months, a true Sabbath. Having that day before we open our eyes to Monday again each week has made such a difference in the rhythms and atmosphere of our home. I take it in like a balm every single week. It’s been about a month since I’ve blogged and the other day, I found myself thinking about how I needed to explain to you all why it had been so long, but I caught myself. Two kids, homeschooling, husband in MBA classes periodically throughout a year along with his everyday job. This is our life right now. Though I wish I could be consistent with how often this space is filled with new words, I just can’t, and I’ve become okay with that. I want to use this little piece of internet that I have well, with intentionality and thoughtfulness, and not just throw words up on a page to achieve a post. 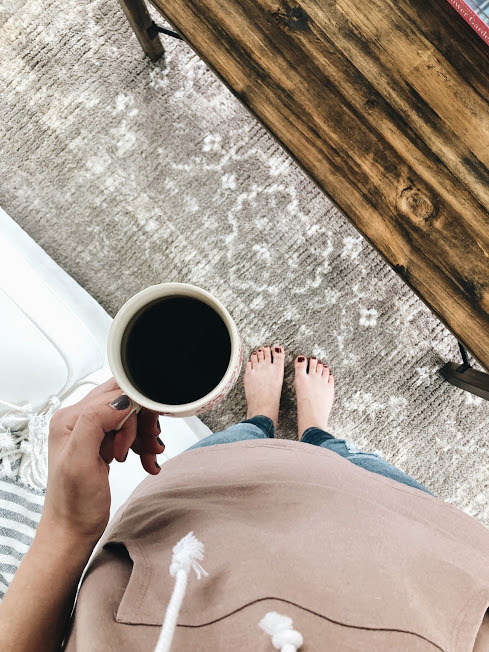 This space is important to me, but the home I keep and the 3 beautiful souls I share it with are far more important, so sometimes this means blogging has to sit simmering on the back-burner for a time. So, I will post as I can and be so grateful for that. That handsome man and I celebrated 10 years of marriage on January 31st. A decade. That feels so surreal to say and also completely normal. I love our life together. He is truly my favorite part of everyday. Thanks to our sweetest brother and sister we got to have a night away right after our anniversary and it was the best. Really truly the best. It was all kinds of needed and such a grace to have. More to come on this later. On another note about that man of mine, I just have to say I’m so proud of him. He is currently in his last week with another MBA class and he, once again, has blown me away with his diligence and his perseverance in a loaded schedule, all while never ceasing to be fully husband and daddy to his three. To be the one by his side in any season is my favorite place of all. You better believe, though, that we are absolutely counting down the h o u r s until we can celebrate the end of this class and a nice 6 week break! It is needed. I began a new rhythm this past week, and I’m quite fond of it already. I began a daily rhythm of reading for at least 20 minutes during the day. This is not my before bed reading time, but reading time during the lighted hours of the day. It’s forced me to slow for a bit and set aside my to-do list and sit my bum down on the couch with a cup of coffee or tea and let myself rest for a bit. It has amazed me what this 20 minutes does for me and the progress I’m already seeing in my books! I highly recommend this to you, my friends. In my need for some more fiction on my reading list I borrowed that last book from a dear friend who LOVED it and whom I very much trust in her recommendations to me. So far, it’s a winner. I’m in the midst of watching, for the first time, the BBC adaptation of Sense & Sensibility and I am thoroughly enjoying it. Edward and Elinor will always, always be a favored couple of mine in the Jane Austen books. I would also very much like to go live in the cottage where the Dashwoods reside after they leave Norland. Have any of you seen First Man? Truth be told, though I love Claire Foy and Ryan Gosling, I was not a fan of this movie. I’ve been dealing with a rather rough bout of skin irritation lately that appears in the form of intense itchiness. Nothing is visible, but the discomfort is miserable. It worsens a great deal at nighttime which has been affecting my sleep nightly for the past several weeks and I’ve begun doing a bit more research into what could be going on and things I could do to help it. One thing my mom recommended is that I make sure I’m using fully natural soaps, with no dyes or fragrances. Like the truly truly natural ones, not the 99.9% natural. Well, some dear friends of ours in GA have begun making soap and lip balm from the beeswax of their little brood of bees and it’s just lovely! Their happy business is called Beelements. I just got a bar in the mail from them and have begun using it. Jessee (our friend) told me that it would probably take several days for it to really begin to make a difference — after the remnant of my other soap clears out — so I am hopeful that with this soap and some other changes I’m trying to make I will have some relief soon. A favorite easy breakfast of mine lately: blend 1 cup almond milk, 1 frozen banana, 1 heaping tablespoon of peanut butter, and 1 scoop of chocolate protein powder until fully mixed in your blender and sip away. I made this bacon and brussel sprout salad the other night with avocado toast alongside and I was quite happy with the results. I bought this drawing book for AK a while ago, but she hadn’t shown much interest in it until the other day. She pulled it out and flipped through it and seemed to decide it was worth a try because about 20 minutes later she held up a drawing of the most adorable duck I’d ever seen! I was so proud of her and so impressed and I know this book encouraged her confidence so much to see what she was capable of. Our food processor has been on its last leg for a while now — I’ve literally been holding it together to make it work — and the other night, I finally fully broke it. Suggestions for a new one? Should I go basic or look at one of those brilliantly fancy machines they have now? I have been searching and searching for a lovely everyday necklace that I can personalize and I am still so unsure! However, I found this website and they have several sweet and simple options that I’m currently perusing. Do any of you have that one necklace you always, always wear? Well, friends, I’ve taken up plenty of your time on this not so short catch-up post, but it’s been lovely being back typing to all of you. I hope each one of you are enjoying a pleasant Tuesday and I’ll talk to you soon. Until next time, lovely ones! I hope you’ve had such a beautiful week! Ours has been sweet, though a bit of a blur as sleep has continued lacking and we are still trying to catch up from last week. Thankful, though, for the ways we’ve seen grace multiplied. We were able to get little man into the doctor and discover he had his first ear infection — poor buddy :(, but praise the Lord for medicine and seeing our boy get on the mend! Honestly, I was so thankful it wasn’t something more intense and the doctor said it was an earlier on ear infection, so God was so gracious in that way! And oh my goodness, I’ve continued to just feel so loved by dear ones even days after my birthday. Surprise gifts being handed to me or showing up on my doorstep. The kindest words in cards or texts. Being taken to dinner by some of the best. Just feeling so encouraged, so loved, and so very grateful for the people that fill my life up. They are the loveliest, wisest, kindest, most thoughtful, generous, loving, and beautiful souls. For my birthday dessert this year I wanted to try the chocolate roll recipe from the Magnolia Table cookbook. So on the afternoon of my birthday, J, Little, and I set to making it. It’s actually quite a simple process and the cookbook has step by step pictures of how to achieve the “rolling” portion which is helpful if you’ve never done it before! The batter is heavy on the egg whites with much less flour and this makes the cake so light and fluffy. The texture and weight is perfect when it’s not only filled with cream, but topped with a drizzle of homemade hot fudge and a spoonful of homemade whipped cream! It was the perfect ending to the day. I would buy the cookbook just for that recipe and Joanna’s homemade whipped cream — it’s my favorite. We cleaned out our basement a week or so ago and are on our way to turning it into a playroom. I can’t wait to have that space set up for AK, Jack, and their friends to go disappear into for hours and imagine, create, make messes, and have a space all their own. I’m trying to piece together my ideas for storage, decor, and the larger pieces of furniture that we’d like to have in the space to make it delightful and comfortable for the kids, and a teepee has definitely topped the list. This sweet one I found on Amazon looks is a great price and looks like the perfect thing to encourages little dreams and adventures. It is quite possible that I’ve mentioned this book to you all before, but Every Moment Holy is a book that I’d like to add to our bookshelf soon. It is a collection of liturgies for the everyday moments and make-ups of our lives. Such things like “a liturgy for the ritual of morning coffee” and “a liturgy for experiencing laughter” and “a liturgy for a husband & wife at close of the day”. It’s bound so beautifully and is something that just encourages a recognition of how profound and meaningful life, in all its various forms and parts, is meant to be, and how present our God is in it all. Jack in these overalls from H&M. When we got them they were a bit too big for him and I have been waiting with bated breath to put them on him. :) They did not disappoint. oh my goodness. He is all sorts of heart-melting goodness in them! I want him to wear them every single day. I find that clothes from H&M seem to fit him well and last us well, too. These Salted Chocolate Snack Bars from Pinch of Yum have become a decent staple for us. They are gluten-free, diary-free, and naturally sweetened. And so so good! I made them once when Meg and Zach (our sister and brother-in-love) were over and they have become a favorite for them, as well! I made a couple of batches for us all to take on our road trip to TX last Thanksgiving and they were the perfect accompaniment to our afternoon coffee pick-ups. I’m going to make another batch when Momma Coobs comes to town next week! My sweet parents gifted me these mixing bowls for my birthday and I was giddy when I opened them! In the last 2 years my two largest mixing bowls had met sad ends so my bowl collection was sorely in need of increasing. These bowls are beautiful, so sturdy, my favorite colors (much more grey tones in there than the picture shows), and with the most helpful little spout on the end of each one. They have already been broken in and are just making my baking all the more happy! This year I’ve begun using a journal my sis-in-love gave me for my “one sentence a day” writings down. I’ll share more on this later, but I’d wholeheartedly encourage you to purchase a simple journal like these and begin doing this for yourself. It’s already been a sweet rhythm for my days.